Mindfulness doesn’t have to be confined to a meditation room. For those who don’t know, mindfulness originates from a Buddhist meditation technique. The idea behind it is to focus on the present moment, becoming aware of your physical senses while letting thoughts drift past like leaves on a river. Many studies have found it to be incredibly beneficial in reducing anxiety, stress and even supporting those with depression. While to start with, it may be an idea to dedicate specific times and places to your mindfulness practice, once you have gotten used to the practice, you may want to try it in other situations. Calling on this technique at any time is what makes it so powerful. 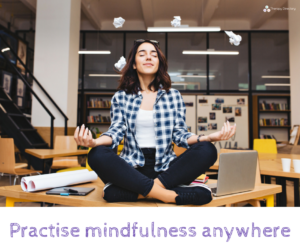 Take a look below for some ideas of where to practise being mindful. If you get a bus or train to work, you may try desperately to fill your time with reading, music or podcasts. We are all for utilising this time, but why not mix things up a bit with some mindfulness practice every now and then? Consider your five senses – what can you see, hear, smell, touch, taste? Public transport usually provides a plethora of things to see, so try and be mindful, taking in every detail. You can also use this time to check in with how you feel, physically and mentally. Observe your thoughts without any attempt to change them. For us, getting our hair done is a lovely excuse to switch off from the world for a couple of hours. Some people love to chat, others use the time to catch up on emails – we say, try a little mindfulness. Notice how the water feels on your head, how the robe feels against your skin. Concentrate on your breathing and invite a little calm into your day. Running can be a great way to practise mindfulness. Many runners praise their runs for helping them clear their minds and it’s easy to see why. When you’re running you’re focusing on the way you’re breathing, the way your body is moving and not much else. Instead of running through your to-do list or ruminating on that argument you had with your partner in your head, focus on the present moment – the way your run makes you feel. If you’re alone in a cafe it can be tempting to reach for your phone or a book. We tend to use this as armour, to protect ourselves from appearing alone. Next time you find yourself in this situation, why don’t you try just observing? Observe the people around you, the way your coffee tastes and the thoughts entering and leaving your mind. Work may not seem an obvious place to practice mindfulness, but we promise it is one of the most beneficial places! If you find yourself feeling overwhelmed, stressed or worried about an upcoming meeting, for example, try taking five minutes to just breathe and focus on what’s happening in that moment. Try not to let your mind wander to the past or stray into the future. Check out our blogs on meditation to learn more about ways to still your mind.